What inspired you to get involved in the organisational side of a major Street Art Festival? 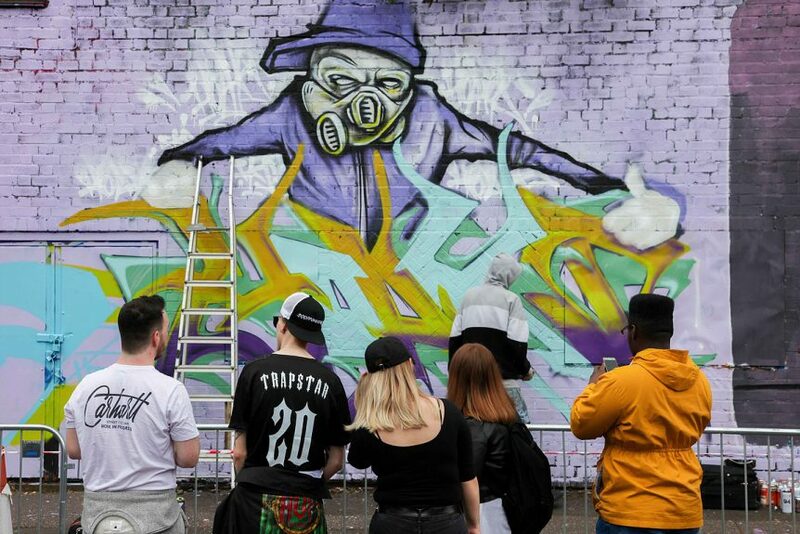 I’d always been a big street art fan (active in street art tourism and photography) and when I saw that there was a team of people raising funds to run Birmingham’s first street art festival, I sent an email asking if they’d like some help handing out flyers. We agreed to meet and we realised my spreadsheet skills could maybe bring something to the table and by the time the festival rolled round, I was a key part of the team and that first festival ended up being one of the most brilliant and exciting experiences of my adult life. By the following January they’d asked me to be a Director which was amazing and totally unexpected and although it was a tough road to the last festival I wouldn’t change a minute. I’ve always skirted around the creative scene but I’m not very confident in my artistic abilities. I do know how to turn chaos into order though so to help on the organisational side has been a great match of skills with the other members of the City of Colours team. I also just wanted to see how those big murals get painted. I just couldn’t understand how they do it. And now I’ve watched them and I still don’t know how they do it. The way everything turned out I only wish I’d started years ago. In your presentation at the Hit the North Festival with Beck’s in Belfast, you discussed Street Art as a key link in the process of regenerating areas which have been allowed to fall into disrepair. Could you elaborate on this? 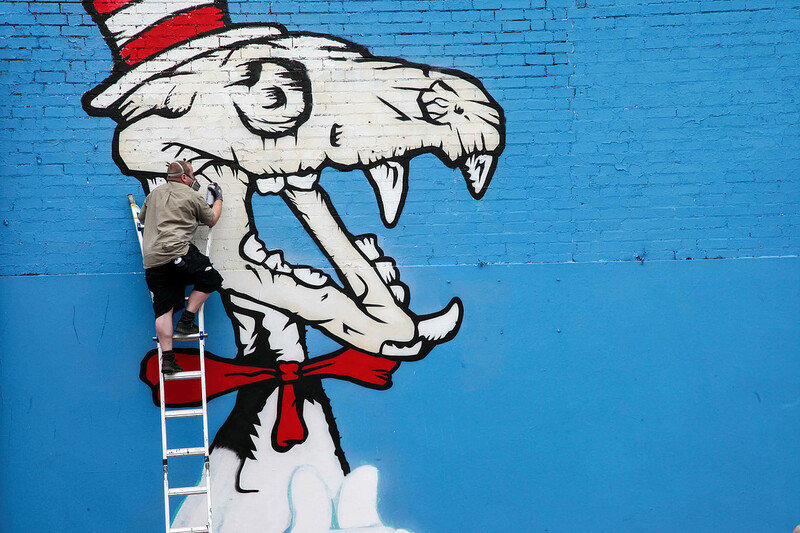 This is one of the really exciting parts of street art, and a side effect that people just don’t expect. The general perspective is that graffiti and street art make an area less attractive rather than more desirable, but it’s amazing what can be achieved with a few well-placed murals and a splash of colour. I saw a Facebook post recently showing walls before and after street art was in place, and the difference is staggering. From cold concrete to warm, beautiful, inviting spaces. 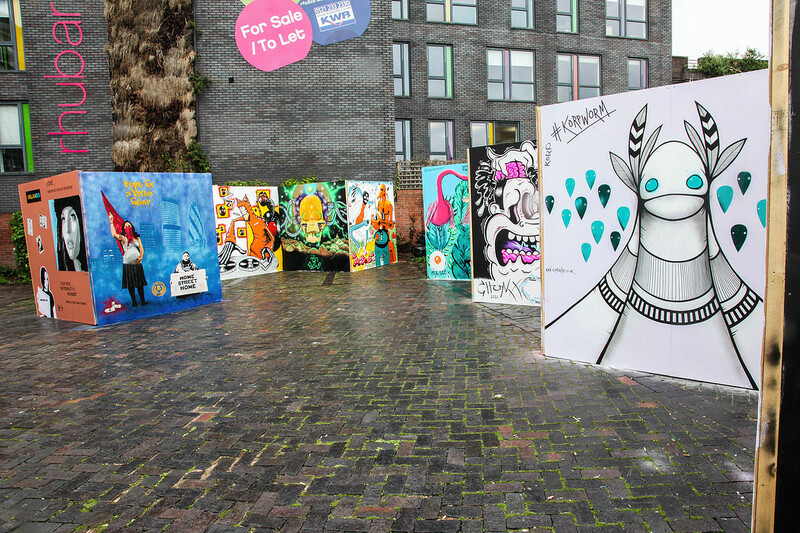 We’re grateful that Digbeth (where City of Colours Festival was held in 2014 and 2016) is half in disrepair, otherwise they’d never give us so many walls to paint on, but the difference after the festival is amazing. You talked about the difficulties in finding funding for the festival. Do you get support from your local council and is public funding made available for the festival? The council have been as supportive as possible in regards to the festival and they love what we do, but they have limited funds to support us and what funding is available has to relate specifically to one of their required outcomes in terms of engaging youngsters or hitting some kind of diversity sweet spot. We’re incredibly grateful though – if they didn’t support us, it would make life much, much harder. Birmingham is putting together a Public Art strategy which we were able to contribute to, which is fantastic to see that Street Art is being considered alongside more traditional Public Art forms. Most of our support comes from the Arts Council although this year we were also lucky enough to deliver a project for the Heritage Lottery Fund as well as receiving funds from local businesses and in kind support from those who were able to provide it. This year we had a corporate sponsor which was a great financial help but a whole other different painful learning experience. A lot of the costs of the festival are very unsexy – scaffold, ladders, security, fencing… and it costs a lot more to put on than people would think. It always gets a bit tight, but you just have to adjust your expectations sometimes. As long as there are artists, walls, paint and smiling people then it’s a success. Funding doesn’t seem to get any easier, but your confidence grows a bit. And of course it all couldn’t happen without the volunteers and the people who just love what you do. That’s how it all started for me. I don’t get paid, but I know I get way more out than I put in. Not everything is about money, only the things that have to be. The City of Colours Festival also carries out community arts projects. Could you explain what kinds of projects you carry out and who participates in these projects? Our most recent project (which is just wrapping up now) is ‘Our Musical Roots’. **(Please see a summary of the project below.) Throughout the summer, City of Colours has been delivering that project: a cross-cultural, youth-led art project, exploring Birmingham’s rich musical heritage. We have worked in partnership with a number of organisations including Birmingham Music Archive, Wassifa, St. Martin’s Youth Centre and Aspire and Succeed. I’ve been to Birmingham so I know it is an incredibly diverse city and I’m assuming that any project in Birmingham would include a multicultural mix of participants. Does City of Colours set out with an intercultural approach to the activities you undertake, i.e that a fusion takes place of different cultural entities in the process of the projects, or would that happen regardless of the approach you took? Absolutely…celebrating and uniting the diversity in Birmingham is definitely something we are trying to achieve. It’s why we are absolutely determined to keep the festival as free entry, even though charging an entry fee would have definitely helped some of our financial challenges. The festival must be open and accessible to all, that’s the spirit of everything we do. We’re lucky to have a strong creative community in Birmingham and they come from all walks of life, backgrounds, areas, cultures – that’s fantastic and I think it’s rare that the people who exist in those communities would ever make judgements in regards to age or race or gender or religion (although we are also lucky that Brummies are a fairly laid back bunch). But it’s not just about those of us who already share a common language, we’re constantly trying to connect with new people, with the lost and the lonely, the people who feel the same as we do but maybe at home or school that doesn’t make sense. It’s about creating a space that’s totally open; come be who you are and create with us, everyone is welcome, while remembering that some may need more encouragement than others to engage. The Our Musical Roots Project is a classic example of this. We really ticked the boxes in terms of diversity and everyone felt included and welcome which is a fantastic result. As long as you like music, dancing, art and good people, well come on in, you are welcome in our gang. Funded by the Heritage Lottery Fund, Our Musical Roots used music and public art to inspire young people to explore Birmingham’s dub, reggae, and South Asian musical history, with a focus on the significance of music in shaping our city and its links to different cultures and communities. To try and increase awareness of Birmingham’s musical heritage, City of Colours, St. Basil’s, and Jez Collins have worked together with children in Highgate, Digbeth and Lozells on a ten-month project called Our Musical Roots, aimed at highlighting the city’s rich musical history. The Our Musical Roots project, funded by the Heritage Lottery Fund’s Young Roots programme, involved children under 16 in underprivileged areas of Highgate, Digbeth and Lozells, and was designed to break down perceptions and increase awareness of Birmingham’s musical heritage.